Do you absolutely love African tales? Then, join Chris Ihidero and Molara Wood this Saturday at TerraKulture by 3pm as they revisit the ancient African storytelling tradition. They will be reviewing Starbook, a tale of a prince and a maiden who are tested by trials in a mythical land where art, imitation and dynamic stillness are supremely important. 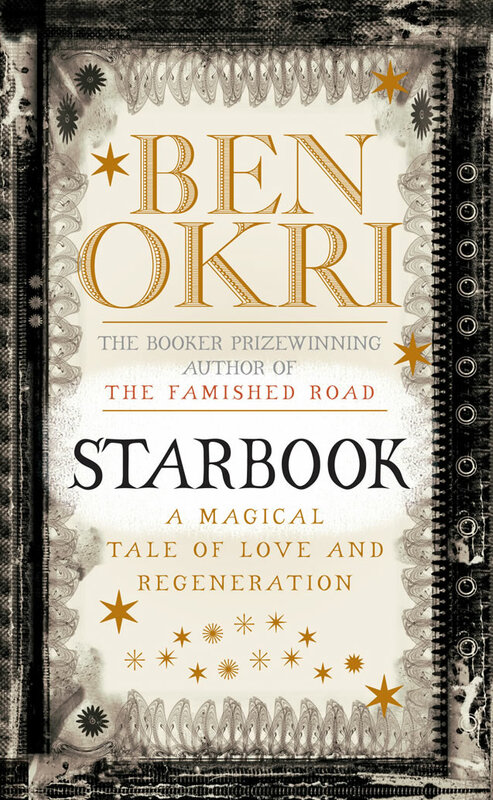 Written by Ben Okri, Starbook is one book that borrows copiously from African oral tradition. Undoubtedly, this edition promises to be exciting as on air radio personality, Wana of Inspiration FM would be moderating. Also, Farafina books will be available for sale at up to 50% off some titles! So, why don’t you come enjoy ‘Tales by Moonlight’? (in this case, tales by daylight!) Who knows, you might win a free copy of Starbook! A new literary ‘baby’ will be born on Saturday, 28th of August, 2010. The ‘baby’, CelebrityRead Africa, is an attempt by Greenwich Media Limited to revive, though gradually, the reading culture amongst African youth, using the ‘celebrity power’. CelebrityRead is a monthly not-for-profit reading event that brings together at least three celebrities from three different industries, to read a small portion from their favorite African literature to a listening audience. After each celeb is done with reading their chosen portion of the book, the audience would be allowed to ask questions, either about the book or about the celeb’s reading habit, and the answers would be provided by the celeb. Celebrities reading at this maiden edition include Tee Mac Iseli, Dan Foster, Ibiyemi, Timi Dakolo and OB Jazz. There will be a lot of books on display at the venue for sales. This gives you the rare opportunity to buy books and have them signed by our featured celebs. Also, the first fifteen entrants get one free African book each (Farafina books, of course!) and there are gifts for every book bought within the events’ venue. Ten lucky members of the audience will get great gifts as well; this would be determined via lucky dips. Refreshments will be served and admission is FREE! We at Farafina are delighted at the opportunity to support this event and we sincerely hope many more events such as this will be born! So, be there! You just might get a free Farafina book! So much has been happening on the Nigerian literary scene these days. From the popular BookJam to the Farafina book review and recently, Celebrity Read Africa, one can say that Lagosians are gradually catching the book reading fever. However, it appears that this fever has now spread beyond Lagos to Abuja. Not only has BookJam been introduced in Abuja, other literary events have found their way into the capital city. One of such events is Infusion. Infusion, founded by Dapo Oyewole and Lola Shoneyin in January 2010, is a literary event that holds on the last Thursday of each month. It is an avenue for lovers of art, literature, music and entertainment to meet in the lovely environs of JB’s Grill in Maitama Amusement Park, Abuja, to enjoy good poetry, art, music and literature. Truly, Farafina Books has come a long way. What started six years ago as a modest attempt to ‘tell our own stories’ has today blossomed into Nigeria’s leading independent publisher. Of course, it goes without saying that many shy away from the publishing industry, but we dare say that we have carved a niche for ourselves since our entry. As expected, there were obstacles, but more importantly, we overcame them. Wanna know more about the Farafina ‘journey’? Pasted below is an article by Belinda Otas of Publishing Perspectives, an international online publishing newsletter. Enjoy! • Established in 2004, Farafina Books has become one of Nigeria’s leading independent literary publishers. With 24 titles on its list — including the work of Chimamanda Ngozi Adichie — the company is leading a revolution in the movement to publish books by Africans for Africans. • Though Farafina continues to struggle against the limitations of publishing in Nigeria, notably poor infrastructure and distribution, the owners believe change is coming and have launched editorial workshops to help engender the next generation of African publishers. LAGOS: In Nigeria, demand is primarily limited to books for the education market. So, how does a literary publishing house thrive and stay profitable? This is the riddle that the owners of Farafina books have been working on since 2004 when they first launched their company. Along the way, they have helped break down barriers within the Nigerian publishing industry and become one of the nation’s leading independent publishers. Obviously, there’s a lot going on the international literary scene and Ben Okri is one African writer whose participation in these events is quite visible. The Booker prizewinner and author of several novels(there are so many of them!) is undoubtedly a force to reckon with in this generation of African writers. Born in Nigeria in 1959, Okri has always promoted the rich and diverse African culture through his works. On the 21st of September, 2010, Ben Okri will be the special guest at the Inspired Speakers Series holding at City Inn Hotel, Leeds, United Kingdom. Unable to attend because you live in Nigeria? Not to worry, the book for review next month (Farafina hosts a monthly book review) is Starbook by Ben Okri. So, your choice, you could either attend the event in London or join us at TerraKulture, V/I on September 4 by 3p.m! My father brought back from England an extraordinary collection of books. He came to London [from Nigeria] to train as a lawyer and my mother brought me (aged one-and-a-half) a year later and we stayed for about six years. His plan was that back in Nigeria he would have time to read all these books: the classics – Homer, Tolstoy, Dostoevsky – and the great books on economics and philosophy. But he got carried away with being a successful young lawyer and didn’t get round to reading them. They gathered dust, and every now and then he’d say to me, “Ben, dust the books – but don’t read them!” That made the books fantastically attractive. I don’t know if he did it on purpose. I wouldn’t put it past him. I would sit on the floor cross-legged dusting a Dickens or Shakespeare, then I’d read for hours until I’d hear his voice, “Ben, what are you doing?” and I’d start dusting again. Books still have this tension for me – the do and don’t, the possibility of danger, of secret knowledge. It makes them very potent. My mum, Grace, was quite different. She was gentle and very tough at the same time, and she never told me things directly. She never said “don’t … ” – she knew that would make me do whatever it was. Instead, she would tell me a story. There were no clear morals, but her stories had an air around them. They were telling you something, and you had to work out what. Some took me 20 years to get. Her mother died when she was just three or four, and she was shifted around between aunts. She knew what it was like to grow up unprotected – that raw King Lear condition with nothing between you and the cold winds of the world. It made her very sensitive to other people’s sufferings. She would say to me, “I can live next door to a hungry lion.” She meant she could get along with all types and bear their awkwardness and nastiness. I can’t live up to that. 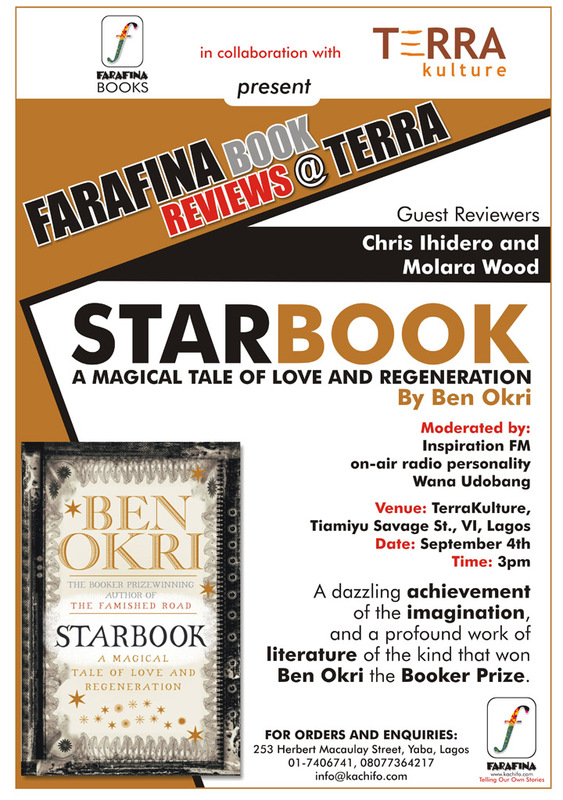 *Farafina Books publishes Starbook, a title by Ben Okri. One of our favourite authors Nnedi Okorafor recently clarified some misconceptions about her book covers on her blog Nnedi’s Wahala Zone. She takes the readers through the thought processes behind selecting appropriate book covers for her works. Book covers are very interesting in that they serve many purposes: marketing the book, accurate depiction of the book, staying true to the author’s intents. All three of these purposes don’t always match and sometimes an author does have to fight to make sure that the publisher’s basic need to sell books doesn’t clash with the storytelling within the book. 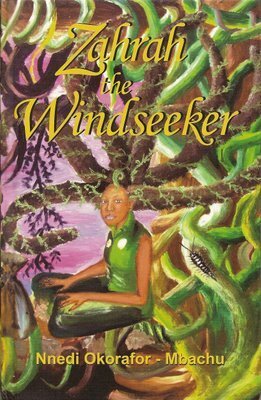 In case anyone was wondering what the Farafina version of Zahrah the Windseeker looks like, there it is to the left. What are your thoughts of it in the context of Nnedi’s post below? Did Farafina Books stay true to the author’s intent? Or can it be improved upon? We did consider doing a separate cover but decided to stick with this one. Today I unveiled the cover of my forthcoming novel Akata Witch, a fantasy narrative set in present-day Nigeria. Already there is moaning about the character’s skin tone being too light. In the midst of all this talk of whitewashing characters, I just want to roll my eyes. I thrive on complexity and get really irritable (and belligerent) when people try to box me in. I want to nip this in the bud right now. I think I deserve some respect and FAITH when it comes to book covers. Even this early in my writing career, I’ve fought valiantly in several battles. Here is the paperback cover. When they showed it to me, I was deeply annoyed with the wisps of straightened hair in this image. My character had dada hair, for goodness sake (basically dreadlocks. I’m not too fond of the word “dreadlocks” because such hair is in no way “dreadful”. However, I occasionally use it for the sake of clarity).